This blog documents personal views about the issues related to applications that the author uses. I came across this post by Steve Stafford while researching a few things related to the Autodesk® Revit® Space element. The post described an issue where the architect wanted to divide a large room into smaller areas for very legitimate reasons. The architect used room separation lines to do this division. The problem was that the MEP engineer still needed a single space element for the very legitimate reason of MEP calculations. Two competing legitimate reasons. What to do? 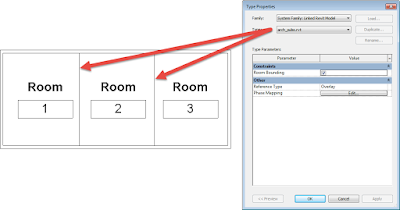 Put the room separation lines in a workset and close that workset? Do some kind of level offset to get the space element "above" the room separation lines? I wouldn't want to manage that model, would you? Use phases for the room separation lines and the sub-rooms? Since rooms are only visible in the phase they are created, that would work. Oh wait, how would the architect actually produce the documentation of the sub-rooms then? I'm going to say this is a no-go too. Have the architect add space separators instead of room separators? No, that just breaks the MEP's spaces too. Aaron Maller probably has the best answer of all: use design options for the room separation lines and sub-rooms. Since MEP folks hate design options, this is doable. The architect would need to produce the documentation from the non-primary design option. What I like about this approach is that it doesn't require any hacks. It is using basic Revit features. But it could be complicated from a documentation perspective, e.g. room schedules. There is one other approach that works if Aaron's superior design options approach won't work. For example, there are already design options in those areas that make it difficult to use Aaron's approach. The other possibility is to place the room separation lines in a separate model! The architect can then link in that separate model as an overlay and mark it as room bounding. The architect is then then place the sub-rooms in their original model. The image below is pointing to the room separation lines that are in the overlaid linked model. The room elements are in the host model. The MEP engineer, when they link in the architectural model, will only "see" one bound room when they place the space object. This is because the room separation lines in the architect's overlaid linked model are not loaded in the MEP model. The room element used/reported by the space element depends on the location of the space's reference crosshairs. The examples below are the same space with only the reference crosshairs in different locations. (The space tag is reporting the room number/name.) Note that the reported room number is different even though the space boundary is the same. A room schedule of the rooms of the architect's linked model will show all 3 rooms. But a space schedule will only report one of the three rooms. This may make it difficult to match the number of rooms to spaces and room/space areas. Aaron's approach would show only the room from the primary design option which does make such matching easier. Ultimately, you have two choices. I would recommend Aaron's approach unless you foresee conflicting issues with design options. If Aaron's approach cannot work, at least you now have a good alternative. Autodesk, the Autodesk logo, AutoCAD, Navisworks, and Revit are registered trademarks or trademarks of Autodesk, Inc., and/or its subsidiaries and/or affiliates in the USA and/or other countries.